Last week, a colleague’s cousin committed suicide. He was in Class X. There was immense pressure from school to take extra coaching classes which he was not keen on. A few months ago, a teenage girl jumped onto the railway track and killed herself. Earlier in the day, police had ‘caught’ her along with her male friend in a public park and threatened to inform the parents. Instead of going home and talking to her parents about the incident, she decided to take her life instead. Every few days, we get to hear about the tragic news of teens killing themselves. 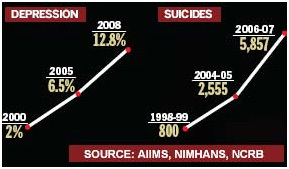 Statistics show that every 90 minutes a teenager tries to commit suicide in India. But every six hours, one succeeds. While, the global teen suicide rate is 14.5 per 100,000, a 2004 study by the Christian Medical College (CMC), Vellore, reported 148 for girls and 58 for boys in India. If globally, suicide is the fourth leading cause of teen deaths, in India it is at number one in some pockets and is the third largest killer all across. Loss of a child can be a devastating life experience for the parents. But losing a child when as a parent one could have prevented it, can be a living nightmare, a life ridden with guilt and fighting every day inner turmoil. Are parents, responsible for their child’s untimely death? The amount of stress that parents pile up on the child by the way of expectations which may be unrealistic or constantly pushing them to meet their approval on all matters, can have a crushing impact on the child. It could be getting a certain grade or a percentage in exams or selection in a XYZ stream or college or adopting a life style that meets their approval. A child who is contemplating suicide must be so sad and unhappy from life and it’s circumstances that ending his/her life is the only solution or escape in front of him/her. As parents, how can we miss the warning signs which our child is struggling to share with us? They say that teens who attempt suicide do not really want to die. Actually, they are crying out for help, attention and love. Communication gap between the parents and children is the key reason for the most of the suicides. Also the generation gap which is due to the changed lifestyles of the parents (when they were kids) and the kids, cause that psychological and emotional gap. And because of this, both can’t relate to each other. If only we can have realistic expectations from our kids, they’d live happily in our lives. If only we can change ourselves and be their friends, they’d live happily in our lives. If only we can teach our children that everyone passes through some difficult obstacles in life and facing them as they come along is the best solution. There’s always a way to overcome those obstacles and we the parents are with them in their life’s journey and they’d live happily in our lives. If only we can share with them that if you can’t solve it, it isn’t a problem – it’s the reality. And the reality has to be experienced not killed, and they’d live happily in our lives. ← Christmas, Santa and Kids!! It’s not a Man’s World anymore!